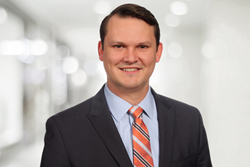 John “Rusty” Lane has joined Kane Russell Coleman Logan PC as an associate attorney with the Firm’s Real Estate Practice Group. At KRCL, we require that every member of our team meets a set of stringent criteria. They must be hard working, they need to achieve results, and they need to know that our clients always come first. I’m confident that Rusty checks all of these boxes. Kane Russell Coleman Logan PC has welcomed John “Rusty” Lane to the Firm’s Dallas office as an associate. As a member of the Firm’s Real Estate Practice Group, he will advise clients in commercial real estate development, acquisition and financing, leasing of restaurants, industrial, and office space, farm and ranch purchase contracts, and property management agreements. He will also represent clients in general corporate matters including trademarking, entity formation, M&A deals, asset acquisitions, and lending relationships. "We are happy to welcome Rusty to the Real Estate Practice Group. At KRCL, we require that every member of our team meets a set of stringent criteria. They must be hard working, they need to achieve results, and they need to know that our clients always come first. I’m confident that Rusty checks all of these boxes," said Gordon Russell, a Director of KRCL. Rusty launched his legal career at a Chicago-based boutique transactional firm, where he negotiated commercial leases and development acquisitions, as well as franchise disclosure documents, and private equity acquisitions with founder rollovers. In 2013, he relocated from Chicago to Dallas and continued his practice representing real estate developers and restaurateurs and doctors in lease negotiations. He earned his Juris Doctor and International Law Certificate in 2009 from DePaul University College of Law and a Bachelor of Arts degree in Political Science from Yale University. Kane Russell Coleman Logan is a full-service law firm with offices in Dallas and Houston. Formed in 1992 with five lawyers, today KRCL has more than 80 attorneys. The Firm provides professional services for clients ranging from Fortune 500 companies to medium-sized public and private companies to entrepreneurs. KRCL handles transactional, litigation and bankruptcy matters in Texas and throughout the country.